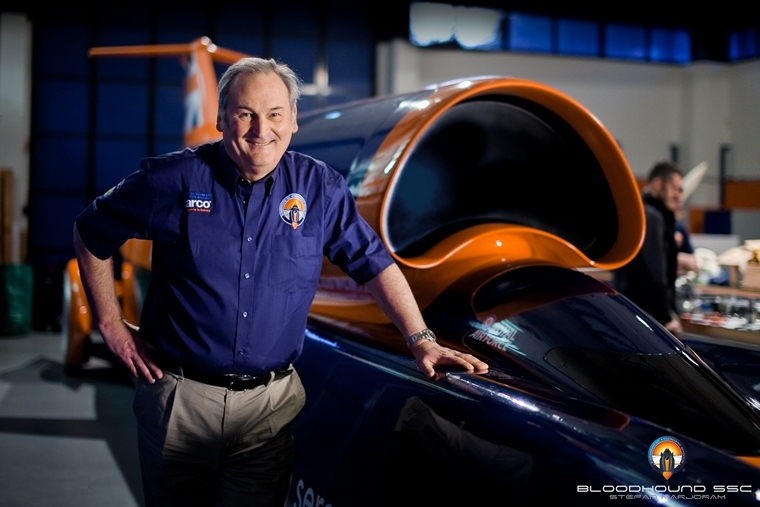 The Bloodhound project was first proposed in 2006 by Richard Noble and Andy Green who between them have held the land speed record since 1983. Richard Noble, engineer, adventurer, and former paint salesman reached 633 mph (1,019 km/h) driving the turbojet-powered Thrust2 across the Nevada desert in 1983. 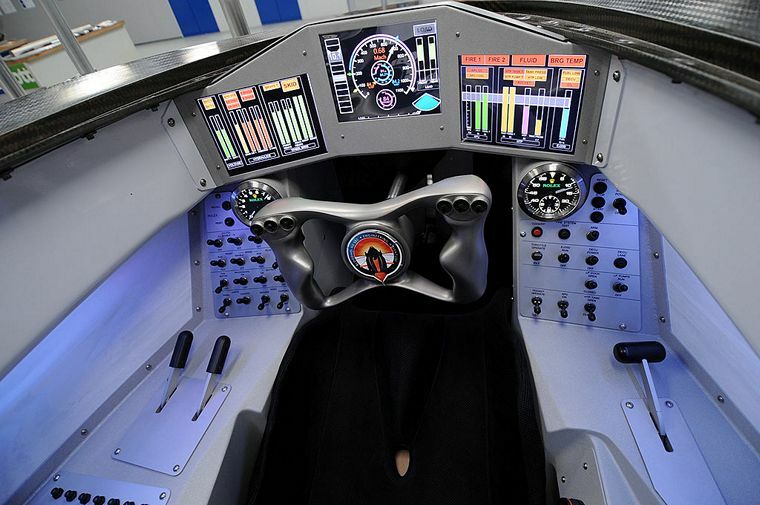 In 1997, he headed the project to build the Thrust SSC with Andy Green a RAF pilot as the driver. 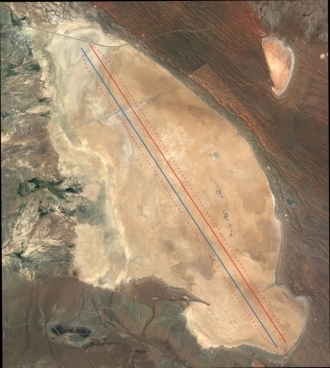 On 25 September 1997 in Thrust SSC Andy Green broke the previous record in Black Rock Desert, USA, reaching a speed of 714.144 miles per hour (1,149.303 km/h). On October 15, 1997, 50 years and 1 day after the sound barrier was broken in aerial flight by Chuck Yeager, Green reached 763.035 miles per hour (1,227.986 km/h), thereby breaking the sound barrier in wheeled land vehicle. The task of driving the Bloodhound SCC will again fall to Wing Commander Green, who will lay feet-first in the Bloodhound. As the car accelerates from 0 to 1,000 mph (0 to 1,609 km/h) in 42 seconds, he will experience a force of approximately 2.5g (two-and-a-half times his body weight). Designing a car able to reach 763 mph (1220.8 K/ph) and to break the sound barrier was a major undertaking. Designing a land vehicle that is a mix of car and aircraft technology to go almost 240 mph (384 K/ph) faster and reach 1,000 mph (1,609 K/ph) is entering uncharted territory. The front section of the Bloodhound is approximately 13.4m long and it weighs in at 7.5 tonnes. Bloodhound is of carbon fibre monocoque construction like a racing car whilst the rear section is a metallic framework and panels like an aircraft. The two front wheels sit within the body and two rear wheels are mounted externally within wheel fairings. The four 36-inch (910 mm) diameter wheels will rotate at up to 10,200 rpm and will be forged from solid aluminium to resist the 50,000 g centrifugal forces. The pencil-shaped Bloodhound is powered by a Rolls-Royce EJ200 jet engine developed for the Eurofighter that will take the car to 300 mph (480 km/h), after which a bespoke hybrid rocket designed by Nammo will boost the car up to 1,000 miles per hour (1,609 km/h). A third engine, a Jaguar supercharged V-8, will be used as an auxiliary power unit and to drive the oxidizer pump sourced from a Cruise Missile. The pump is able to feed 400 litre of oxidant per second to the Nammo hybrid rocket engine. Together the two powerplant will produce more than 135,000 horsepower: that's more than six times the power of all the Formula 1 cars on a starting grid put together. Stopping at the end of its high speed 11.5 miles (18 kilometre) run the Bloodhound relies on air brakes that will be deployed at 800 mph (500K/ph), parachutes at 600 mph (375 K/ph) and friction brakes at 200 mph (125 K/ph). Finding a surface on which to attempt the record in itself was a major undertaking. Verneuk Pan in the Northern Cape, the site of Malcolm Campbell's 1929 record attempt, was despite the mountains of stones initially the firm favourite for the attempt. Campbell had a gang a labourers prepare a track 120 feet wide for him. It took them three months to complete the task. Bloodhound would require a track 11.5 miles (18 kilometres) long by .93 mile (1,500 meters) wide, 40 times the size of Campbell's! Hanksteen Pan. Photo © European Space Agency. A full survey by Bloodhound partners in the attempt, the Northern Cape Government, to confirm the work required almost ended South Africa's participation when it was revealed that the shale bed was breaking up underneath the playa surface would cause major problems. Fortunately there was an alternative-Hakskeen Pan. Hakskeen Pan, right in the North Western corner of South Africa, was initially dismissed because of a large dirt road running across it. However, a new tarmac road was built across the end of the Pan and the old dirt road became defunct. Over 11.875 miles (19 km) long, 8 miles (5 km) wide, very hard and very flat, apart from some surface stones, great access, nearby accommodation, on-site power, good communications and ideal weather this was the location they had been chasing for over a year and a half! Best of all, Hakskeen Pan is still in the Northern Cape and Bloodhound already had the full backing of the Provincial Government. The local government saw that the huge global PR, the national excitement, and the close links with the Bloodhound education programme would all benefit South Africa enormously. 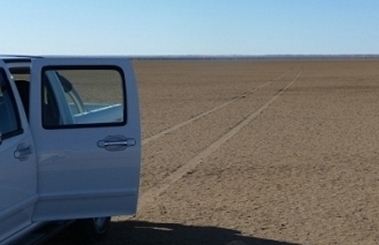 The smooth flat surface of Hakskeen Pan. Phot © Bloodhound SCC. Work on preparing the track has been continuing with 310 people from the area picking up thousands of tons of rocks on Hakskeen Pan. MTN have erected five mobile phone towers, each 70 metres high, so that the world can follow the record attempt via the three video feeds and 300 data channels. Data from over 300 sensors, plus three streams of 720p video, will be transmitted live via single channel from the Bloodhound as it blasts down the desert racetrack during the test. By way of comparison, a modern F1 car transmits 150 channels of data over a single radio channel during a Grand Prix weekend. 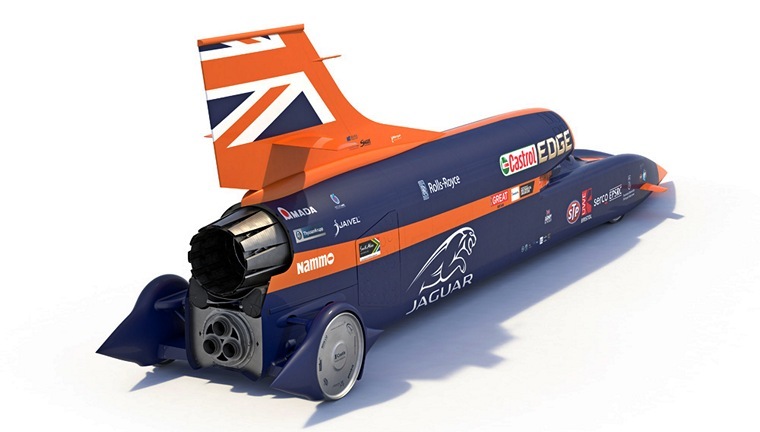 Each run by Bloodhound SSC will generate information equivalent to 125 MP3 music tracks played concurrently. 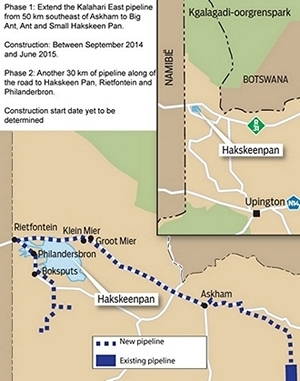 Hakskeen Pan Pipeline. Photo © BloodHound SCC. The 800MHz signal is highly focused, rather than broadcast, to ensure the network has 'link budget' capable of streaming 4 Megabytes per second of data live from the car as it covers a mile in 3.6 seconds (a kilometre in 2.25 seconds). In 2017 it will travel to the team's Mission Control Centre and then be relayed to the nearest town, Upington, 80 miles (130 kilometres) away, to be fed into the internet, ready to be viewed by schools, colleges and other audiences worldwide. It is estimated that thousands will flock to the pan to witness the attempts. Water in the area is scares and to cater to their needs a pipeline is being constructed. The pipeline that will also benefit the 10,000 residents of adjacent communities of Mier, Noenieput, Askham, Big Ant, Little Ant, Loubos, Rietfontein, Philandersbos, Andriesvale Welcome and about 130 small cattle farms . The first attempt will be to break the current record. Each attempt will consist of two runs to be completed within an hour of each other. To establish a new record the average speed of the two runs over the measured mile in the middle of the 11.5 miles (18 kilometres) track must exceed that of the previous record of 763 mph (1,228 km/h). The greatest challenge will be to recover the car within an hour, service and refuel and attend to any problems and get it to the starting line for the return run. Over the next eighteen months speeds will progressively increase until the magic 1,000 mph (1,609 km/h) record is reached and verified.